Bill Mason jumped at Arnhem on the 21st plane that went in on 17th September 1944. He was 21 years old his wife Violet was pregnant. Bill was dropped about 7 miles from Arnhem and the first time he came under fire it was in the streets leading into Arnhem where the Dutch people were coming out cheering our guys on. From nowhere sudden machine gun fire rattled down the center of the road and up the front of a house they had just ran past, eventually reaching the houses just before the bridge. Bill was in the mortars and the mortar pit was about 100m from the bridge. They were under constant sniper attacks every time they ran backwards and forwards to the pit. Bill was in house 12 on a corner the command post was house 14 where John Frost was. Due to bad planning such as batteries not charged for the radio’s and ammo shortage, the 2nd Battalion gave their all – but you can’t beat Tanks with rifles and after 3 days Bill was taken prisoner. 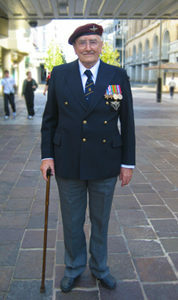 Garry his eldest son was 6 weeks old when Bill came home after 9 months in a prisoner of war camp.